Are There Benefits of Cocoa Butter Lotion? 3 Are There Benefits of Cocoa Butter Lotion? Pregnant women go through many physical changes including weight change and skin problems. Keeping your skin hydrated may increase the suppleness and elasticity that it has. Palmer's Cocoa Butter claims to benefit pregnant women's skin if used on a regular basis. Using Palmer's Cocoa Butter has no risks, which means that the potential for benefits is worth a try. Palmer's Cocoa Butter Formula is a lotion or cream designed to reduce the effects of pregnancy on women's skin. It comes in tubs and squirt dispensers at many retail stores. According to Palmer's, their Cocoa Butter Formula should also have healing and softening properties to dry, irritated skin. Although the lotion is non-greasy, the cream is thick and should be used sparingly. Palmer's Cocoa Butter Formula is made from a thick vegetable fat that comes from the fruits and pods that cocoa trees produce. 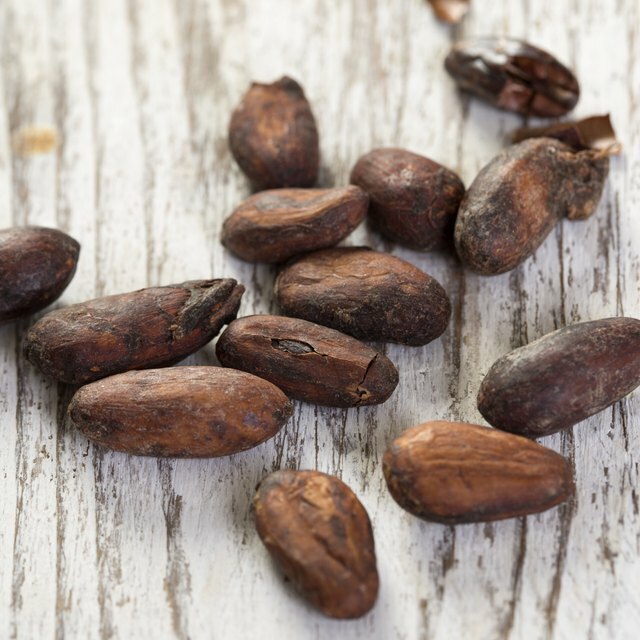 Many people hear that it comes from a cocoa tree and might assume that it has caffeine, which is in chocolate. Pregnant women do not need to worry about there being caffeine in Palmer's Cocoa Butter Formula. It contains no caffeine, which doctors agree does not harm fetuses in small doses. It contains rich emollients and vitamin E, which is used to condition the skin. It has a solid, buttery texture at room temperature and melts with bodily contact. Author Colette Bouchez states in her article "Stretching the Truth" that women have used cocoa butter for generations because they believe it prevents stretch marks during pregnancy. Many women use it because they think that the potential it has to help makes it worth a try. Although doctors cannot vouch that it is effective for stretch marks, many women continue to purchase it and swear that it is effective. Choosing to purchase and try Palmer's Cocoa Butter may depend on whether you are at risk for stretch marks. According to the Expectant Mothers' Guide article "Preventing Stretch Marks During Pregnancy," 75 to 90 percent of all women and 90 percent of white women develop stretch marks during pregnancy. You cannot tell whether your skin might develop stretch marks until it already does. One method to tell whether you are at risk for stretch marks is to ask whether your mom got them. They are typically hereditary, which is why some people say that they cannot be prevented with Palmer's Cocoa Butter. Will Stretch Marks Go Away after Labor? Many women continue to use Palmer's Cocoa Butter after pregnancy to prevent and diminish the appearance of stretch marks. They eventually turn into thin, silver lines, which some women believe happens quicker using Palmer's Cocoa Butter. Some women continue to use it even if they did not get stretch marks during pregnancy. They want to make sure that their skin stays healthy looking while they lose the pregnancy weight.